14 ounce heavy duty plastic mug. 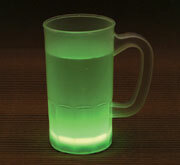 Glow steins require a 5 inch stir stick, not included. $1.13 each for 48 or more. $1.01 each for 144 or more.